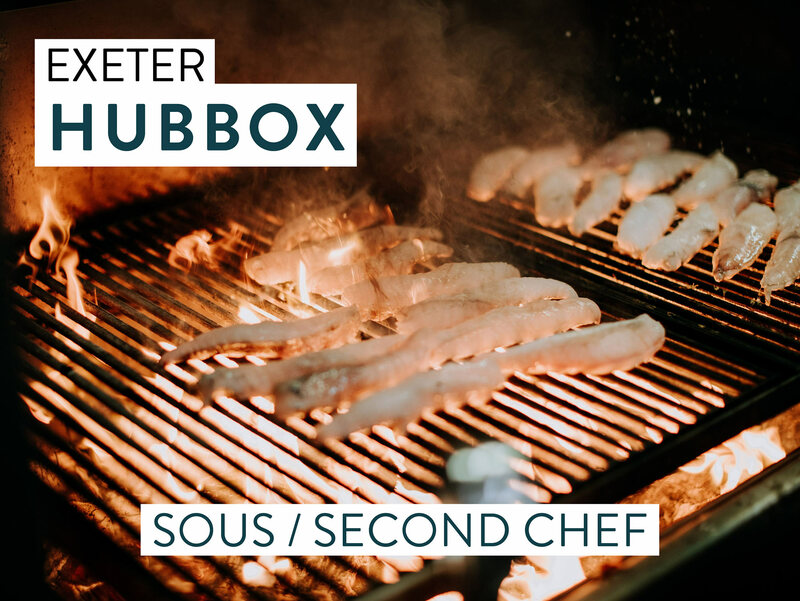 WE ARE LOOKING FOR A PASSIONATE SOUS CHEF WITH PLENTY OF EXPERIENCE, ENERGY AND ENTHUSIASM TO SUPPORT OUR HEAD CHEF AT OUR BRAND NEW HUBBOX IN EXETER. Our new restaurant in Exeter in on Catherine Street and has had a flying start with our regulars and also gaining a lot of new fans too. We are looking for someone to build on Hubbox’ core values of great products, delivered by great people, in great locations. We deliver the highest standard of products throughout the day: artisan coffees and breakfast in the morning; a varied menu from light lunches, healthy salads, hand-made gourmet burgers and hotdogs; to successfully deliver such a range of products, we need a driven Head Chef who understands our passion for provenance and product quality. Our Sous Chefs show great care in developing their teams and also progressing themselves to take on the reigns in the absence of the Head Chef. They also are accountable for Food Margins and Managing P&L’s. In return of your hard work, we offer up to £25k p.a as well as various staff perks, incentives and our Annual Beach Party. We are also keen that you have enough time in your week to do things that make you happy and have a decent work life balance. Hubbox is fast becoming known as the place to go for quality casual dining in the South West and we were judged in 2015 the “Best Burger in the UK” at the National Burger Awards. We also won the ‘Best Group” award at The Bristol Good Food Awards, 2018. There will be opportunities aplenty within our ever-evolving business for right-minded people focused on a hospitality career.